Now, among these four posts, as you might expect, there will be some repetition of certain songs. Here's how it breaks down. Three versions each of "Move Away Jimmy Blue", "The Ones That You Love Lead You Nowhere", "Always The Last To Know", "Hatful Of Rain", and "Stone Cold Sober". Plus two takes each of "Here And Now" and, perhaps surprisingly, "When I Want You". You may not feel like you need 'em all, or you might wanna compare and contrast. LINK IN COMMENTS. Please leave one when you take it. Because courtesy shouldn't be The Rare Stuff. Thanks for all the Dels. And for the Patti Smith Post. And for your great site. 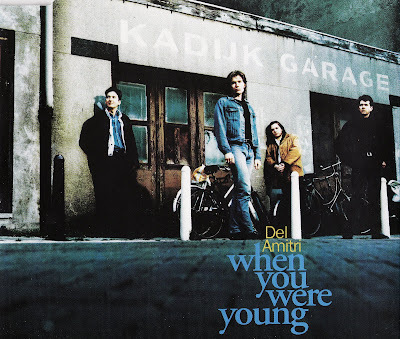 Thanks for the Del Amitri stuff... a very underrated band right from the get go... and a truly great World Cup single for Scotland a few years back with very honest lyrics! You're welcome, José. Thanks for saying so. You're welcome, too Anon 1, and Ted. Thanks for the Del Amitri. Good band that's underrated. Thanks for all the Del Amitri, a great band that never got the recognition they deserved. Looking forward to more if you got 'em! This stuff is GOLD! All these b's are fantastic. I was going to ask you which live versions you have but it appears you have the same ones I do. Just to be sure; is the Chicago stuff from Grant Park July 96? The whole show is brilliant. Also, do you have the Slims San Fran 95 (likely where Ace of Spades is from)? Thanks for all your effort, it's much appreciated. MPLS - Not sure of the date of that live track but it doesn't seem to be from that 7/96 show, at least my setlist of that one doesn't contain "Being Somebody Else". I don't have the single here now but I'll look and see if the info is provided. The "Here and Now" single tracks are listed as "Live at T in the Park", which I should have mentioned above; It's apparently a Scottish music festival but I'll check that for dates too. I do have the Slim's show, but the "Ace of Spades" in question is from the Live at Abbey Road disc. There is apparently a tape of a show from Philadelphia, Aug. '95, which I don't have. Do you? Thank You! Great sound quality! Perhaps its just home city pride creeping in here, but I've always thought that the live version of "Being Somebody Else" included in this set surpasses even the recorded version. Simply superb performance. Thanks again for the uploads, and really thanks again for uploading the whole series! Fabulous effort bud. These guys had the best B-sides in the business. Like the early Oasis singles. Something about the early 90's I guess.